So earlier this week I posted the product of my go at the 24-hour comic. Now that pictures have surfaced of the event, I'd like to give you a glimpse of what it was like. 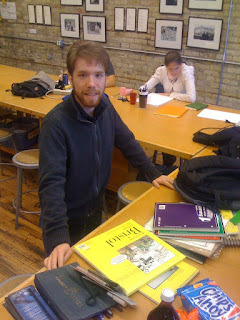 So the place was hosted at the Open Book, part of the Minnesota Center for Book Arts. The event started at nine and I got there at about ten. And when I landed, I met up with my longtime friend Sarah Kopitske and her two friends Jake Herrick and Amelia Maple (they don't have websites yet or I'd plug them immediately). The three are current students at MCAD. There were many other talented artists there. I'd say that most were also part of the Cartoonist Conspiracy, but some of them were new people I'd never met. 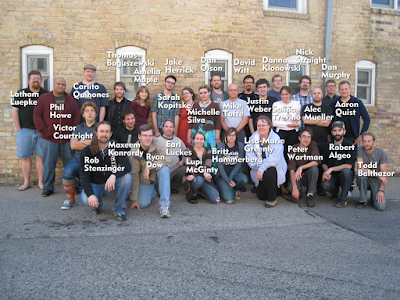 Many were recent MCAD graduates. MAKE studio, which is a design and animation house based in Minneapolis, was also represented pretty well. Let's get started on some comics! At two o'clock, David Steinlicht took a picture of us all. So, what began for me as a plan to coolly and calmly make a new page every hour quickly saw me spending six hours on the first two pages. So by the time nighttime rolled around, I was pretty much in a "noble but doomed" state of improvisation. A bunch of us traded art cards with the lovely artist Michelle Silva. Sometime in the night, Danno Klonowski toured the place with a recording device and interviewed us all, asking us about our backgrounds, what we thought of the 24 hour comic, whether or not we thought we'd finish, and a couple other questions. Listen to our answers in Danno's "Lutefisk Sushi" podcast! As the night grew very old, many of the artists went home, finished, quit, or fell asleep. At some point in the night I stopped drawing, too, in favor of talking, exploring, and accidentally activating security alarms. When 7:30 the next morning finally arrived, Kevin Cannon came in with donuts and coffee for us. David Steinlicht took another picture of the remaining artists, and then we parted. It was beautiful. Bring on next year's.